4 Foreign Inmates Escape Bali Prison Via Tunnel : The Two-Way Police spotted the tunnel Monday morning and believe the escapees remain nearby. 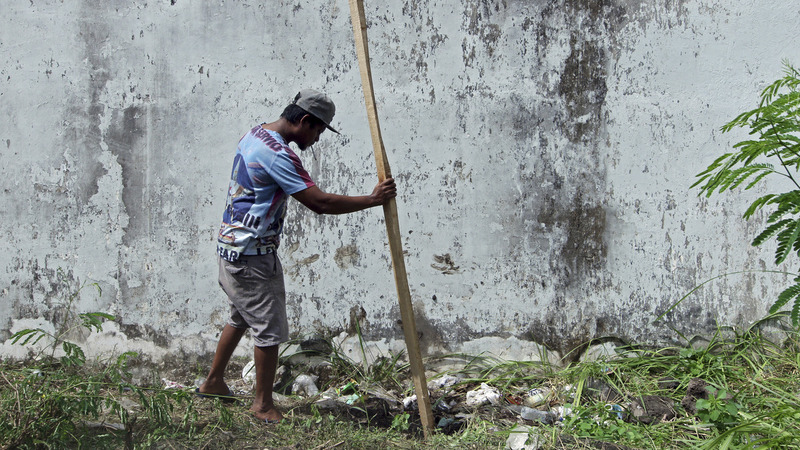 A man puts a wooden stick into a hole through which four foreign inmates escaped from Kerobokan prison in Bali on Monday. Indonesian police are looking for four foreign inmates who escaped from an overcrowded Bali prison by crawling through a narrow tunnel dug under the prison's walls. Police spotted the tunnel Monday morning and believe the men are still close by on the resort island, Reuters reports. "The tunnel is about 12 meters (39 feet) long and we suspect it took more than a week to build," Tony Nainggolan, head of Kerobokan Prison, tells Reuters. The tunnel was about 20 inches by 30 inches wide. Police identified the four men as Australian Shaun Edward Davidson, Bulgarian Dimitar Nikolov Iliev, Indian Sayed Mohammed Said and Malaysian Tee Kok King. They were serving time for crimes including drug offenses and violating immigration rules. The Sydney Morning Herald reports that Davidson, 33, had less than three months left in his sentence. He had fled to Indonesia after an Australian arrest warrant was issued for him in 2015. Indonesian police arrested him about a year later, saying he had overstayed his visa and was using somebody else's passport. Kerobokan Prison is where another well-known Australian, Schapelle Corby, was imprisoned for nearly a decade on drug smuggling charges. She returned home last month. Kerobokan houses nearly 1,400 inmates, more than four times its capacity, Reuters reports. Bali is a popular tourist destination and many of Kerobokan's inmates are foreign. Indonesia is known for its strict anti-drug laws. The New York Times reports the prison has a reputation for overcrowding, corruption and rioting. Last month, more there 300 inmates escaped from an overcrowded prison on Sumatra.